Celebrities know how to dress to impress. However not all get it right on the red carpet. These incredible outfits stood out to us as being the best of all time, and we are sure you will agree. Check out Hollywood’s hottest babes rocking the season’s hottest styles. Jennifer Lopez just stepped onto the red carpet in a feathered and embellished Balmain gown with a large cross in the center evocative of stained glass. This actress is a stunner and looks a million dollars in every outfit. This dress, in particular, caused a lot of head turning when she showed up to the Vanity Fair Oscars party last year. This top model has big hopes and dreams and has expressed her desire to take up acting and win a coveted Oscar one day. We are not sure about that, but one thing we do know, she absolutely killed it on the red carpet. Irina Shayk in Versace left us truly floored. The hot mama model wowed the crowds on the red carpet in this revealing number, making men and women speechless. Ariel Winter stole the show at the Primetime Emmy Awards in 2017. She wore this gorgeous halter dress by Australian designer, Steven Khalil. The black and grey dressed was embellished with silver sequins and to thigh high splits. The Modern Family star is a regular at Red Carpets events despite being just 20 years old. Kendall Jenner has risen to stardom, becoming one of the world’s hottest top models, alongside her best buds Gigi and Bella. She recently hit the red carpet, leaving little to the imagination, and that material with those heels, a recipe for disaster was just waiting to happen. This worldwide sensation has strutted her stuff on many catwalks and red carpets, but we are sorry to say that this dress should never have made it onto the red carpet. The South African beauty, radiated on the red carpet. Her tanned skin and blonde hair complemented the dress perfectly, and it is no wonder that this outfit is one of her finest moments. We cannot wait to see what she wears this year. Adriana Lima is one of our favorite supermodels and we’re sure you can see why. The stunning Brazilian model has been gracing the Victoria Secret’s catwalk since 1999 and even with the years passing by, she only gets more gorgeous. We are in love with her look for the Vanity Fair Oscar Party where she wore this black strapless velvet dress with a striking red lip. Oh Adriana, we just love you! The Met Ball 2018 was centered around the theme of heavenly bodies. Kim Kardashian certainly looked heavenly in this gold Versace number which flaunted her curves fabulously. We really love this outfit, and we think it is our favorite from all of her Met looks so far. Well done Donatella. The top model and her sister always turn heads, no matter which red carpet event they attend. At the Vanity Fair party, Gigi’s cut out ensemble was definitely a crowd pleaser. But let’s be serious, when is she not? This model and actress is famous for her curves and assets. She leaves little to the imagination here at the Vanity Fair Oscars party, but she is definitely oozing Marilyn vibes. Karlie Kloss isn’t just a drop-dead gorgeous Victoria Secrets model, she’s an entrepreneur looking to make a success out of her non-profit Kode With Klossy. In fact, in 2015 she took a two-year break from modeling to study at New York University. We don’t think there is anyone that this white and silver dress could have looked better on. She oozed sophistication in this jaw-dropping dress. Cate is another celeb who always gets it right when it comes to awards season, and this Armani Prive gown with 3D floral detailing was the perfect ode to old Hollywood glamor. Lupita Nyong’o stole the show in this baby blue Prada gown. The floaty shape, the fabric, the neckline, it all just worked so well, there is nothing not to love about this look. Amanda Seyfried just exuded demure on this Oscars night. Her Alexander McQueen gown, paired with her classic hairstyle, offered a timeless look. Well, what can we say? Amy Adams’ Oscar De La Renta look was a memorable one in 2013. The American Hustle actress looked the picture of grace and elegance on the red carpet. Let’s see if she can top it this year. This young beauty, definitely made headlines with this number. Some have argued that she won the look for best dressed, while others have disagreed. What do you think? French Renaissance chic, or Les Miserable? What comes to mind when we see this dress are swizzles, the sherbet rainbow candy sticks. Faith you are very talented, but this dress is just truly an Oscars fail. The southern beauty will look amazing in anything, but the stylist missed the boat with this one. The Victoria’s Secret Model never fails to impress, and certainly wowed in this number. There is more skin on show than material here, but she is just perfection. Yet it doesn’t leave much to the imagination. Kate Hudson, shone in this gold number. When it comes to the red carpet, she really has it down to a fine art. We wonder what she will pull out of the bag this year. This statement dress will go down as one of her best. The red lips against the yellow dress and her porcelain skin, just absolutely nailed it. Everything about this look is a red carpet winner to us. 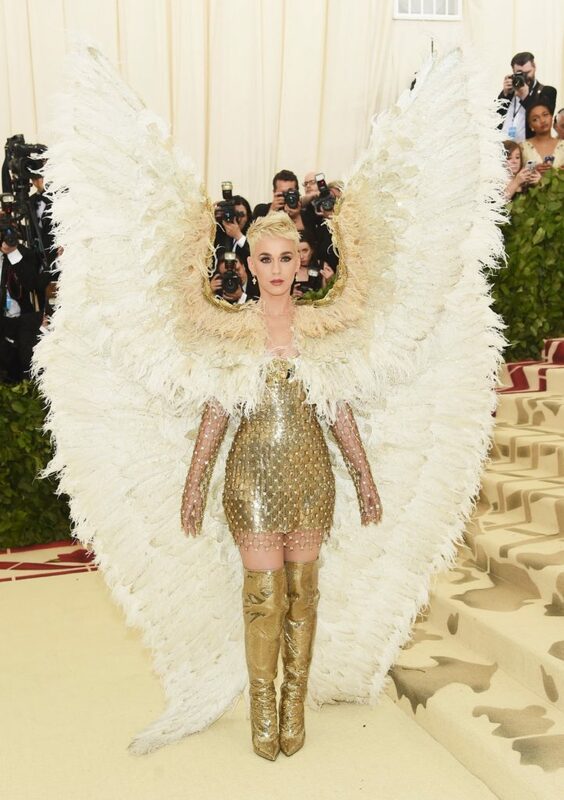 Katy Perry’s interpretation of tonight’s theme is appropriately next-level: a gold Versace chain mail minidress, thigh-high boots, and giant feathered angel wings, which reportedly span six feet. 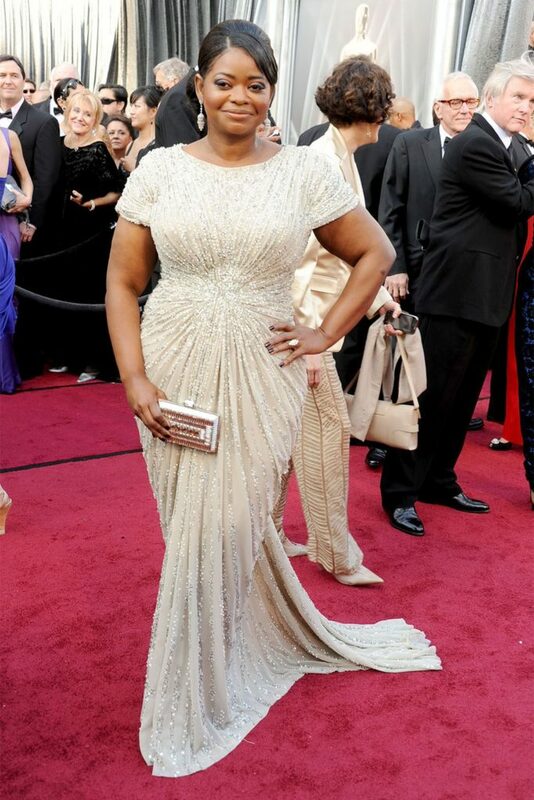 Octavia Spencer sparkled her way down the red carpet in Tadashi Shoji, when she accepted her Best Supporting Actress award for The Help in 2012. Zoe Saldana made a statement at the 2010 Oscars where she wore a Givenchy Haute Couture with a crystal embellished bodice, but it was the tulle ruffled skirt that made a lasting impression. It could have gone either way with this number, but we think she looked totally breathtaking. 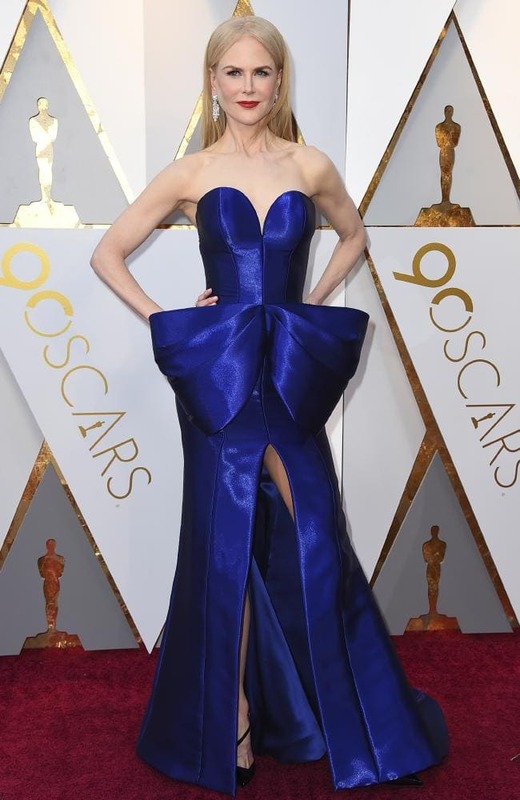 Meryl Streep usually plays it safe, but this Lanvin number was a bold statement to make, and it totally worked. Streep also took home the gold for The Iron Lady that year. We love her. The actress wowed the crowd in this sheer number. Showing off her curves perfectly, this dress was a winner, even if she didn’t go home with a gold statue. 2012 was the year her dress went viral and inspired thousands of memes online. Angeline Jolie’s pose in her Atelier Versace gown with her left leg showing became known as the ‘Angie Leg’ and started a fashion trend worldwide. The top model looked angelic in this white ensemble, showing off her long lean figure. She was the picture of a heavenly demure body at the Met Gala 2018. Cher always pulls out all the stops when it comes to her Oscar outfits through the years. The Academy asked Cher to present the award for Best Supporting Actor this year and she made an entrance. She stole the red carpet in this wild headpiece and black jewel-encrusted look. JLo absolutely nailed it in this breathtaking Elie Saab gown in 2015. The neckline, the coloring, the shape, it all just works so well, and Jenny from the block certainly scrubs up well. This one of our favorite looks ever. We love Katniss Everdeen and Jennifer even more. She always seems to have a red carpet tumble wherever she goes, but always plays it off so well. Here she rocked a simple but chic cropped top and skirt, and she looked beautiful. Charlize wowed in this classic red Dior number on the red carpet. She has been affiliated with the French design house for years, appearing in their J’adore Dior fragrance advert. This gown was simple yet left a mark on the red carpet. The queen of pop certainly made a statement with the King on her arm as her date. They both look very glamorous, head to toe in sparkles and fur. Oscars chic. This outfit caused a lot of controversy on the Red Carpet as she attended the famous yearly Vanity Fair Oscar Party. It is very daring, but we have to say wow she looks incredible. Blake Lively in Atelier Versace at this year’s Met Ball was truly a dream come true. She graced the red carpet looking like a regal queen. 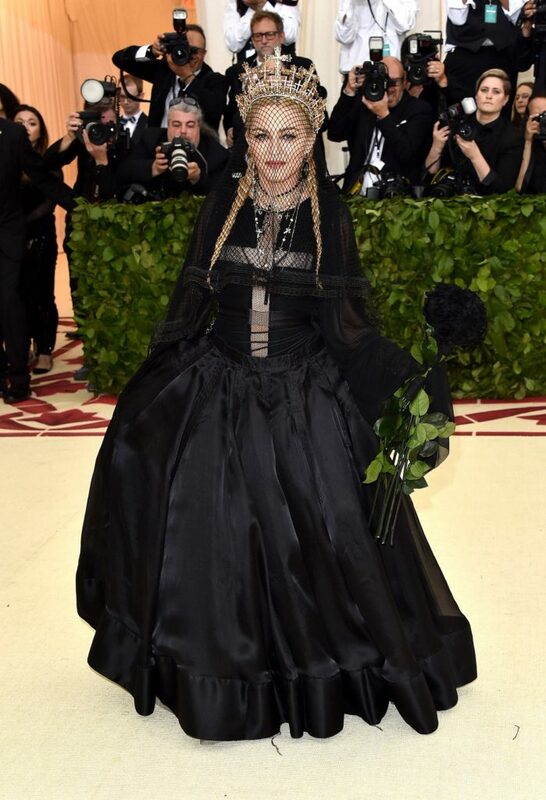 Madonna takes a Gothic turn on the red carpet in an all-black, full-skirted look that includes a cross top, a black rose, and heavy veiling kept in place with a crown. It’s a far cry from the coquettish bunny-eared Louis Vuitton by Marc Jacobs look she wore to the Met Gala in 2009. Well well well, Ri Ri is definitely known for experimenting with fashion, but here she has really pushed the boat out. We are not quite sure if this is extremely innovative and revolutionary, or just a big no-no. The pink eyes and cheeks just accentuate the fact that she looks like a valentines bouquet. 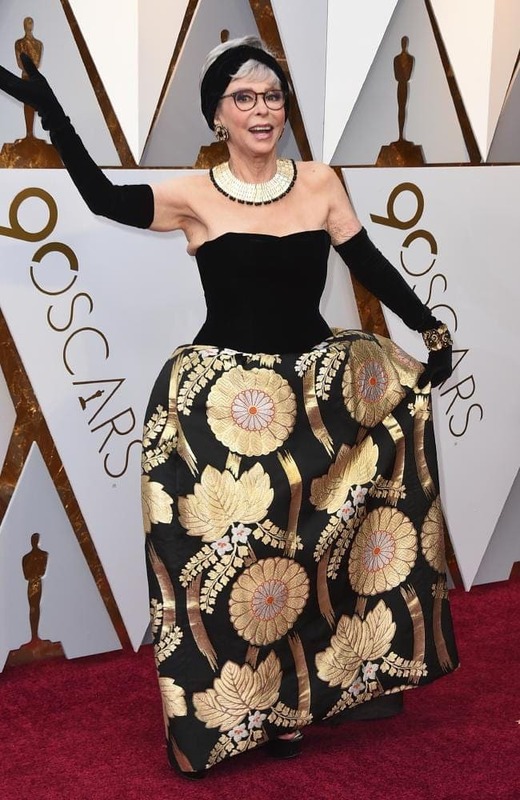 Back in 1962, Rita Moreno won the Oscar for Best Supporting Actress wearing an elegant black and gold boatneck gown. When she first wore the glamorous gown, Moreno won the Best Supporting Actress award for her role in West Side Story—marking the actress’s first Oscar win. Fifty-six years later, the actress hit the red carpet wearing the same look. She even wore the same black satin opera length gloves. Amazing! Nicole Kidman looks like a red carpet queen, here at the 90th Academy Awards. Definitely on the best-dressed list, for her cobalt blue Armani Privé dress, that was tailored to perfection. Trust Rihanna to make a statement on the Met Gala red carpet. As cochair of this year’s event, expectations were particularly high. She just arrived in a pearl- and crystal-embellished Maison Margiela Artisanal gown by John Galliano, complete with a matching papal miter and necklace. When Daryl Hannah paired elbow length gloves with her glamorous gold dress and long blonde waves at the 1988 Academy Awards, she got heads turning. We wonder how well this would go down this year. We’re all for being adventurous when it comes to fashion but Sarah Jessica Parker might have taken it one step too far. The star wore this interesting ensemble in 2015, ultimately turning quite a few heads, and not in a good way. We’re not sure the headgear was necessary. KKW is known for some fashion faux pas on the red carpet. However thanks to her rapper come designer husband in tow, she dazzled on this red carpet.